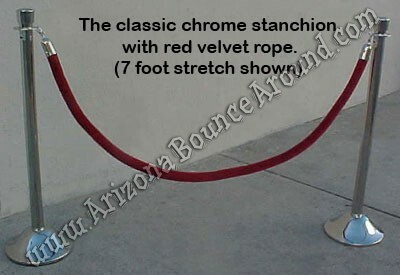 Our Stanchion rentals are $14 per stantion and we rent the red rope for $8 each. We offer the red rope in Velour or Twisted Red Rope and both are 8 feet long and have chrome hooks on each end. The distance between stanchions will vary between 7 and 7.5 feet depending on how tight you stretch the rope. Our chrome stanchions with red rope will make a great impression at your open house, grand opening, movie night, themed party or to welcome special guests. We also rent several different sizes of red carpet and can provide custom red carpet backdrops known as a step and repeat backdrop for red carpet events.